Nove ukraïns’ke slovo [«Нове українське слово»; New Ukrainian Word]. 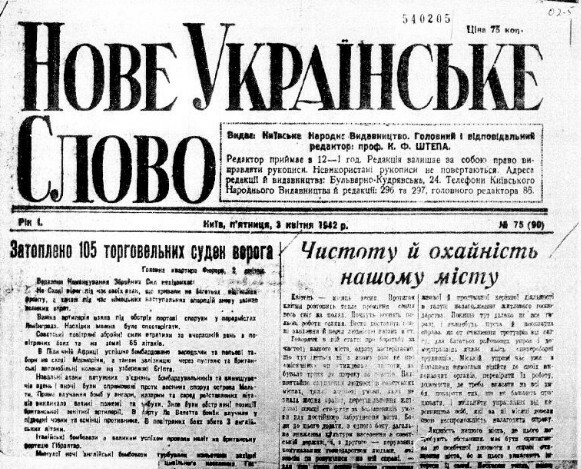 A daily newspaper published in German-occupied Kyiv from December 1941 to 1943 (a total of 531 issues). Edited by Kostiantyn Shtepa, it replaced the suppressed Ukraïns’ke slovo (1941) and was avowedly pro-Nazi and anti-OUN. Some articles on Ukrainian cultural and historical topics were published in it.